Hunger Games - Map of Panem. . HD Wallpaper and background images in the los juegos del hambre club tagged: hunger games map of panem the. Really good, but I think that District 11 should be bigger cause it said it was the biggest, and District 12 should be smaller, but otherwise, awesome. ^ I agree. But this picture really helps me with my imagining of the districts. 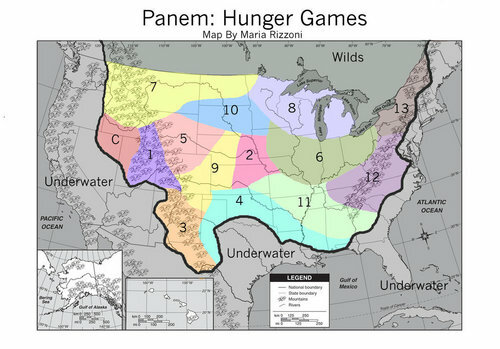 ok I don't like this map 1. because the capital is in the rockies, 2. it says Panem is in North America which includes canada,3. aren't there gaps between each district full of wilderness? I could name about 10 flaws with this map, but otherwise- Good Job. Hurray! I love looking at this. I'd be in District 11, isn't that agriculture? I do live on a ranch. haha. I would wanna live in District: 4! I mean Finnick's my love and I love sushi and I love the careers except that Rue killer from District:1! Stellina199722: I agree. the districts dont touch because wilderness is between them. Unless for some reason, the wilderness is part of the district. but probably not since its illegal to go into the woods. Oh come on, I'm in district 8? I guess judging by the map I'd be around District 12 :) Oooooo Hey Gale how you doin?! shouldn't the fishing district be in and around Michigan?? btw why is Michigan in 8??? Id be in district 12 0_o cool i guess..
ok so there are a few things wrong. The capitol is supposed to be in the rockies, and I think that the districts are a little farther and more spread apart cause Bonnie and Twill traveled awhile before they reached 12. What about Canada? The capitol is sapposted to b in colorado!!! U can't exclude that detail, I live thare!!! I don't want to slave away in 2!!! Niiiiiiiiiiice! i would want 2 be in district 13... new york rocks.even if its underground. It's good but the captol should be where district 1. I would be in district 12!! District 2 is closer to the Capitol than another I think. soooo where the heck do i live! ah you kno what screw I choose 12!!! before it gots blown up! Well i like your idea of the placing but it seem a little off.!! but great idea! plus i live in Cali so id be underwater! AAAHH!! For some reason, I imagined the districts in Canada. And much smaller. I WOULD LIVE IN CAPITOL, EVEN THOUGH IN THE END I WOULD BE DEFEATED THAT'S OK!! Cool!I thought the districts were much smaller! I would have to go to district 12 because I'm black. this is almost entirely incorrect. I have a question. Were do the doctors go? Guys really back off of him/her they did what they could too put this together nd you guys won't stop hating him for a couple flaws. Like come on really there only mistakes, and at least he tried UNLIKE YOU GUYS! All I can say is NICE JOB!!! I'm in district 12, almost in district 11. In the third book, it says that 13 and 2 are close. I would live in District 13!!! I live in Northern Colorado so according to the top map I'm in district 5. This is a pretty good representation except for the fact that Panem is North America - not the United States. OMG IM IN DISTRICT 12!!!!!! District 2.... FANTASTIC... I think. And 2 should be by a mountain since its the Nut! Maybe Rushmore? to small. NORTH AMERICA NOT AMERICA. im in district 11. but its pretty colorful. This has to be incorrect. The districts are tiny. There is no possible way that 4 states worth of space can fit in one courtyard for the reaping. ummmm District 12 should be around Kentucky. Otherwise, its ok.
What - the underwater of california(and western coast),texas and florida(and eastern coast) ????? also what about hawaii and alaska district ??? If Norfolk, VA was on the map, if it's not already, I'd be in District 12! Whoo! I like it, but it has a couple flaws. First of all, where's Canada? Second, the districts are in incorrect places and 3rd... I don't know if this was in the comments, I didn't read both pages but, on the victory tour, it says that Katniss went down through dist. 11, then 10 then 9 in order, but how could she have gotten from 11 to 10 without going through the other districts?